KANSAS CITY, Mo. 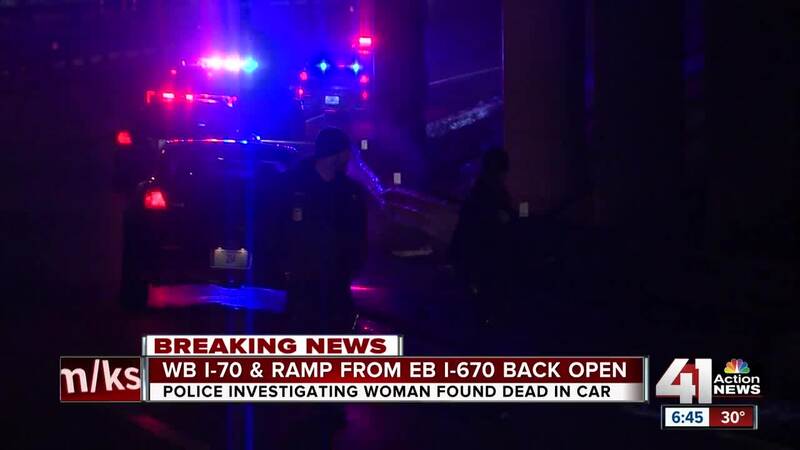 — Kansas City police shut down Interstate 70 westbound for more than two hours early Wednesday after officers responded to a reported crash and found a woman shot to death in a vehicle. KCPD said that Kansas City Scout offices alerted police to a crashed car on the ramp from I-70 westbound as it enters the east side of the downtown loop. Officers arrived at the area shortly after 3 a.m. and found a woman dead in a vehicle. It appeared she had been shot. I-70 westbound past Troost Avenue reopened just after 6 a.m. The ramp from I-670 eastbound to I-70 westbound also reopened. Police recovered empty shell casings in the area. While the highway was closed, the forensics team hoped to gather as much information as possible. "They’re investigating exactly the path of the vehicle that it took. They are using crime scene investigative technology to get a better picture of what happened," KCPD spokesman Sgt. Jake Becchina said. Police have not identified the woman who died. Becchina said no witnesses had come forward early on, but detectives are asking anyone who might have seen something to contact police. Call the TIPS hotline at 816-474-TIPS or the KCPD Homicide Unit at 816-234-5043. Stay with 41 Action News for updates on this breaking story.